Why do nuclear power stations (and other power stations, for that matter) have cooling towers in that weird half-hourglass shape? I presume the guys who built them knew what they were doing, but what did they know that I don't? I pledge to eventually answer your question, Ian, but first I'm going to rabbit on interminably about power stations. 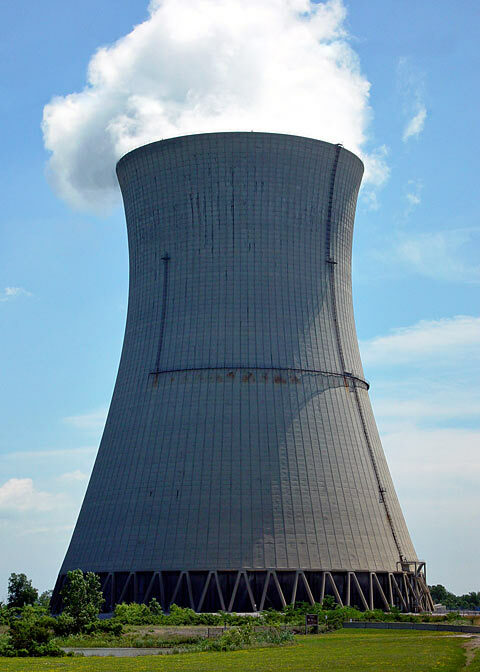 The cooling tower has become emblematic of nuclear power stations, and the white "smoke" drifting from the top of them is a source of vague nervousness for a lot of people. But, as you say, other kinds of power stations have cooling towers too. I live less than an hour's drive from Lithgow and the Mount Piper and Wallerawang Power Stations, able to produce 3.4 gigawatts of coal-fired electricity between them; Mount Piper has two cooling towers, Wallerawang has one. The "smoke" that comes out of these towers is actually just clouds of tiny water droplets. Power stations need cooling towers, or some other heat-sink like water from a convenient river, because they are heat engines. Heat engines, as I've written before, become more and more effective as the temperature difference between their "hot end" and their "cold end" increases. ...which stands on a wide circular displacer-piston cylinder and can run on the heat from a cup of coffee or tea, or backwards on a cup of ice-water. I've got one that runs like this, but really low-friction versions of the design can run on the heat from a human hand, if the ambient temperature is cool. Conventional power stations, whether fired by coal, combustible gas of one kind or another, or a nuclear reactor, make their electricity by turning a turbine connected to a generator. Gas-fired stations can do this directly with a gas turbine, which is essentially a jet engine tuned for shaft-turning power, rather than thrust. Coal and nuclear stations make electricity less directly, by using the heat of combustion or nuclear fission to boil water and run a steam turbine. Anyway, that's the hot end. A well-designed heat engine will try to get its cold end as distant in temperature from the hot end as is practically possible. The ratio between the two temperatures, expressed in Kelvin (or any other temperature scale, as long as it starts at absolute zero), determines the maximum possible efficiency of a heat engine. Steam-turbine power stations, on the other hand, may emit exhaust gases from the burning of fossil fuels, but the system that makes the actual electricity is a closed, Rankine-cycle steam/water circuit. The burning fuel or fissioning atoms heat cool water to steam, the steam turns a turbine or three, and the turbine exhaust then goes to some sort of cooling device, generally a heat exchanger, that dumps the final unusable portion of the water's heat somewhere. This "somewhere" can be a separate water supply, either a river, large lake or sea, or it can be evaporating water in a cooling tower. Once the heat exchanger has cooled the closed system's water in whichever way, that water is pumped into the boiler again, and the cycle continues. You might wonder why you need to dump heat from the turbine exhaust, when you're only going to heat the water up again in the boiler. There are two practical reasons for this. The first reason is that the exhaust from a power turbine is almost all still water vapour, because, in brief, turbines made to run on a flow of hot gas do not like it if the gas condenses to liquid inside them. The second reason is that the pump that returns the water to the boiler has the opposite preference; it only works with liquid water. It would be possible to use a gas pump instead and make a system in which the working fluid is always vapour, but the energy needed to run a gas pump against pressure from the boiler is high, while the energy needed to run a water pump is trivial (by power-station standards), on account of the incompressibility of the water. The upshot of all this is that standard 20th-century power stations are pretty miserably inefficient. Today, there's much more effort being made to reduce the heat wasted, by for instance transferring some of the heat of the turbine exhaust to the water feed between the pump and the boiler, or by using some of the waste heat to keep nearby buildings warm ("cogeneration"). These sorts of measures can only go so far, though, so cooling towers of one shape or another will continue to be built. Which, finally, brings us back to the classic cooling-tower shape. Cooling towers actually come in all shapes and sizes; large air conditioners, for instance, often have evaporative coolers for their chillers, but those coolers don't look anything like a power-station cooling tower. Power-station coolers have to have very large capacity, so they inescapably have to be very large. Power-station coolers also have to provide a decent convective "stack effect", also known as "draught" (or "draft", in the less-demented American spelling). But, importantly, power-station coolers don't really need to be able to hold up much more than their own weight, plus any remotely plausible wind loads or shifts of their foundations. The classic curvy cooling-tower shape fits all of these requirements. In engineering terms, because cooling towers don't need to hold up an interior full of offices, they can be built as a "thin-shell structure". You could build a cooling tower out of giant Great-Pyramid stone blocks if you wanted to, but a surprisingly thin reinforced-concrete shell, built in layers from bottom to top (not unlike the way 3D printers work), is the usual solution. And the builders almost never balls it up. The final question that occurs to me in this area is why cooling towers are hyperboloids, but factory chimneys are cylindrical (or close to it - they often taper a bit toward the top). This is because the cooling tower wants to move a vast amount of low-pressure air. The evaporating warm water at the bottom of the tower produces a steam/air/water mixture that isn't much warmer, and thus less dense, than the ambient air, so it has little buoyancy compared with the ambient air, won't move terribly fast, and so has to pass through a really wide pipe. Factory chimneys, on the other hand, are moving a much smaller volume of much warmer gas, usually combustion-product "flue gas". This is usually quite a lot hotter than ambient, so it rather wants to go up a chimney and doesn't need a wide one; you just need a nice long chimney, both to get a strong stack effect and to discharge the gas as high up as possible, to spread the pollution by dilution, as it were. Ah, flense. What a marvellous little verb that is! I wonder... everyone's crazy about solar cells, but what if we were to concentrate solar light on the hot side of a properly-sized stirling engine and hooked that up to a generator? A mirror steam plant, in other words (like, yes, the one in Fallout New Vegas), but on a smaller scale. It seems to me a few mirrors and a mechanical engine, with sufficient maintenance, would have a lifetime much longer than solar cells that have to be replaced every few years. Possibly they might be more efficient? They already exist. :) Along with various other interesting varieties of thermal solar power. Awesome! Next question: where does one get a stirling engine of bigger-than-model-scale size without having to sell one's first-born to pay for it? I used to work for a Big Oil company, and power generation was always a major concern. We had a slightly different definition for "cogeneration". Often, a refinery has its own power generation (fueled at least in part by the methane that gets boiled out during the refining process), and due to fluctuations in seasons and demand, often had more generation capacity than required for their own operation. In this case, they send the power to the grid and get paid for it. The process of using waste heat to heat buildings is known as "waste heat recovery," and is a common practice, especially in colder climates. As for miserable efficiencies, it's not as bad as it once was. If you take a gas-fired turbine generator (the jet-engine kind), and use the hot exhaust gasses to boil water, it becomes a "combined cycle" system, and can get up to IIRC a theoretical 75% efficiency, which is remarkably high. The phase changes in typical systems are a real efficiency-killer. That energy is wasted in the rankin cycle, which is why high temperature differentials are so important. The higher the delta-T, the smaller the percentage of energy wasted in phase changes. Probably the nicest characteristics of the cooling tower design is its simplicity. There isn't a single moving part (other than valves for controlling the flow of coolant) in the whole thing. Because of the stack effect, the air moves itself through, and the hotter the coolant gets, the stronger the stack effect becomes and the faster the air moves, so it's a bit self-regulating as well. What is happening in this photo (which I found here)? Sorry if this is a really silly question, but is this people inside a cooling tower while it's in operation or is it something else? If so, it could certainly dispel a few myths the public might have of how dangerous they are. I have never seen something like this before. Yup would appear to be people inside a cooling tower while in operation. You can see in the pic there reall isn't that much dangerous about them, it's not much more than your average pond fountain with a chimney above it. Well...If your pond was full of hot water. After some googling I haven't had too much luck finding exact temps for the sprayed water, im sure it would vary depending on the installation. But I've found a couple graphs showing in the 30-40°C region. So, it'd be a bit like a hot, 100% humidity jungle or a sauna rather than boiling you alive. The temperature may also depend on the power output of the plant, so they may have been in there while the plant was in semi-quiescence. What's the relevance of Michael Palin in conjunction with cooling towers? Watch the 142 min European cut, if you have a choice. The 132 min American release is also good. Avoid the "Sheinberg Cut" (also known as the Love Conquers All cut). I'm sure others will back me up here. And welcome to Brazil. Perhaps because I'm a math nerd, all the sources I read point excitedly to the fact that a hyperboloid is a ruled surface (in fact, a doubly-ruled surface), which means that it can be constructed based on straight beams, albeit at kind of funny angles. But is this actually how they're constructed? Your description makes it sound like not. No, in layers from bottom to top. You probably could make a hyperboloid of modest-building size with a lot of straight poles, though; a sort of lath-and-plaster approach using adobe/mudbrick materials over a pole frame. You'd obviously need some sort of horizontal hoop reinforcements to stop the whole frame collapsing like the start of a game of Pick Up Sticks, but I wouldn't be surprised if the number of hoops needed was less than five, for a shed-sized structure, and they could be rope or basket-y materials woven through the poles. Try a scale model, using wooden skewers, string for hoops, and maybe plaster of Paris with lots of short pieces of thread stirred through it for the adobe/mudbrick material! I've seen wickerwork objects built this way, things like vases and tables. It's not clear to me what the forces on each straight element are; if they're primarily bending forces, then it's not necessarily much help to build an object this way. On the other hand, if you use two crossing families of straight elements and join them at every crossing, you do get a hyperboloid, but I'm not sure whether it's rigid or whether you can squash and stretch it into a range of shapes (by twisting each joint). Macroscopically this comes from twisting the top relative to the bottom, letting you go from a double cone to a hyperboloid to a cylinder and back. Adding rings as you suggest would help, though it's worth checking whether the rings need to be on the inside or the outside or both. Actually, I bet some of the rapid-prototyping wonks know the answer to this, because a family of straight rods plus some perforated rings makes a pretty structure. I should test this out with the CNC router at the local hackerspace.